Write Well Always: Smart FM. Learn Stuff. 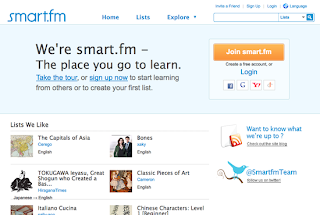 The only social networking site that I know of that helps you learn languages and a whole range of other subjects. It works using user generated information and their special programs like iKnow, Dictation and Brain Speed. 1. iKnow! is our flagship study tool for memorizing information and it’s probably where you’ll be spending most of your time. Built around years of research into memory and learning, it’s like a personal trainer for your head. Its adaptive learning technology creates a personalized schedule just for you, scheduling items for review just when you need to study them. 3. BrainSpeed is a light (and light-hearted) tool for quickly getting exposure to whatever you’re studying. It randomly chooses items from the list you're studying and presents them to you in rapid-fire sessions for quick review. You can even add your own information and use it as a little study session to help with memorization. This site is perfect for vocabulary but is no substitution for a class setting or in depth study of a subject. Still, It is a great site and a very useful addition to the social networking world. ahh something different. I guess i learn something when i come on here lol.